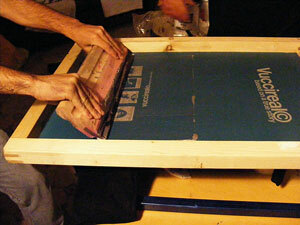 Screen Printing is a special technique that creates a sharp-edged image using a porous fabric and a stencil. The printing technique can traced back to the beginning of the 19th century and gained popularity during the first world war for making banners and printing flags. A screen made of a piece of porous, finely woven fabric including silk, polyester or nylon is stretched over a wooden or aluminum frame. Areas of the screen are blocked off with a non-permeable material (a stencil) which in turn is a negative of the image to be printed. The screen is placed on top of a piece of paper or fabric. Ink is placed on top of the screen, and a rubber blade is used to spread the ink evenly across the screen. The ink passes through the open spaces in the screen onto the paper or fabric below; followed by lifting of the screen. The screen can be again be re-used after cleaning. For multiple colour screen printing on the same surface, the ink is allowed to dry and then the entire process is repeated with another screen and different color of ink. Screen printing technique make use of and is compatible with a variety of materials, including textiles, ceramics, metal, wood, paper, glass, and plastic. It is this quality that allows this printing technique to be used in different industries, from clothing to product labels, fabric labels to circuit board printing etc.